Build a fanciful quilt block by block, stitching either one mother bird or two baby birds in each. The smooth, curvy pieces are a snap to machine-appliqué, and the retro-inspired design encourages the use of bold, bright fabrics. Chicken wire print fabric and 1940s feed sack reproductions from Glenna Hailey’s Rise ‘n Shine collection for Maywood Studio combine for a cute wall hanging. Machine-blanket-stitch around the appliqués using black thread and accent the borders with fussy-cut farm print border corners. Stars created with a spirited mix of prints and tone-on-tones are sprinkled among a rosy Irish Chain of Double Four-Patch blocks. It’s easy to make this quilt bigger or smaller by adding blocks to or subtracting blocks from each row. Mix and match the prints, florals, and stripes of the Flag Day Farm collection by Minick & Simpson for Moda Fabrics. Create a cool and tranquil quilt from low-contrast prints that have a hint of shimmer. Two simple blocks create intriguing secondary patterns. Place dark and light prints to make the star blocks of Sea Glass appear more square and boxy than they did in the original quilt. Using Heather Mulder Peterson’s Cottage Charm collection for Henry Glass & Co., this wall hanging showcases dark reds and browns for the borders and star block centers, and is filled in with pastels. Evening Star blocks—light stars on dark backgrounds—provide the focal point on a toile wall hanging. This rich, dark table runner makes a great housewarming gift that comes together quickly. Pick navy and burgundy fabrics from the Briarcliffe collection for Timeless Treasures to use in a small version of Midnight Garden. Five Evening Star blocks are each framed with a neutral print. Two borders — 1"- and 4-1/4"-wide — complete the quilt. The wide outer border utilizes the same bold floral as the setting triangles. Struggling to come up with pleasing fabric combinations? While color, print, and texture make a difference, the secret is contrast. Learn here what you need to know to create a striking quilt. For this wall hanging version of Balancing Act, choose candy-color prints from Johnny Karwan’s Delilah and Delilah Wheels collections for Clothworks. Because they’re made of tone-on-tones in a variety of colors, the outer triangles in the pieced triangles clearly stand out from one another. Any print containing black looks striking in the triangle centers. 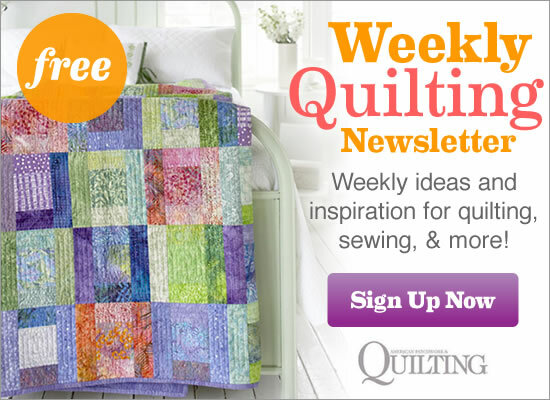 Show off even the smallest scraps of reproduction or vintage fabrics in a miniature quilt. Bolder pieces set sail in the large triangles, while shirtings and small prints balance out the look. Small triangle-squares from tone-on-tone rose prints create pieced sashing rectangles that flow together almost like a watercolor painting. This version of Vintage Voyage features the Bouquet Impressions collection from P&B Textiles. Show off your needle-turn appliqué skills on an elegant throw. Subtle shifts in color mean the Parisian-inspired motifs are nearly hidden. Each of the colors in the center flower medallion was inspired by the palette of the floral outer border. A one-block version of Artfully Inspired features the Journey collection by Gudren Erla of GE Designs for Red Rooster Fabrics. Use fusible appliqué, stitching each shape in place with thread that closely matches each piece. For an eye-catching piece of wall art, try framing the piece and hanging it on point. Discover the “crazy” way of making stars—no precise matching points and no paper piecing. Just layer fat quarters, cut through all of them at once, and shuffle the deck to easily create stunning stars. To change the look of Star Power, skip the sashing and join blocks in straight-set rows. Marie Osmond’s Blanc et Noir Fashion prints for Quilting Treasures are set off with fuchsia tone-on-tones. Two finished borders visually separate the quilt center from a finished outer border. Soft, sophisticated flannels in Danhui Nai’s Tapestry of Colors collection for Wilmington Prints inspired a romantic throw. By piecing together just three block rows, this is a quick-to-finish project!